Hello! It's the final day of Lawn Fawn Inspiration week, all the new products will be available tomorrow! But first a couple cards with the new pop up dies, Everyday Pop-Ups and Stitched Hillside Pop-Up. I used one of the Everyday Pop-Ups to create a cute little scene for my witch doxie. I cut the pop-up from the striped paper and layered it over Storm Cloud cardstock cut with the Little Town Border and Black Licorice cut with the Stitched tree border. 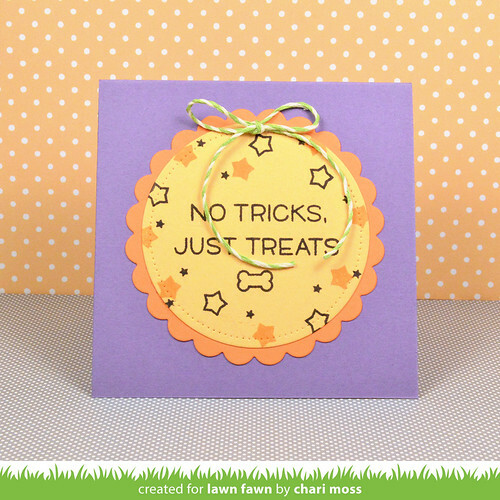 I added a small Dotted Circle for a moon and some Black cardstock grass for my white embossed sentiment. 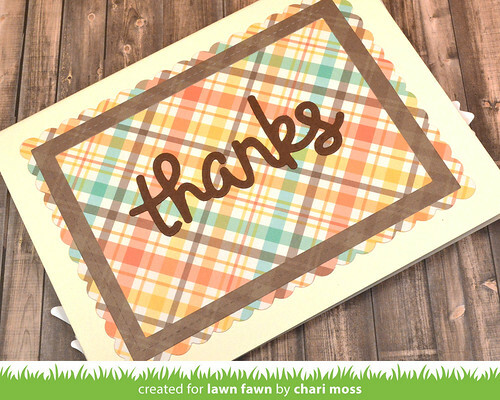 For my Stitched Hillside Pop-Up card I kept the front simple with Perfectly Plaid papers and a die cut sentiment. 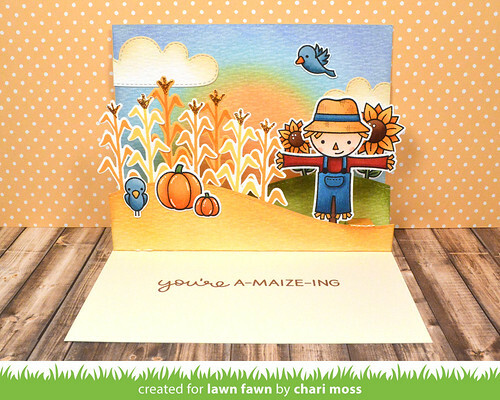 The inside scene is created with a lot of distress ink blending and Happy Harvest stamps. All the images are colored with copics and cut with the coordinating dies. 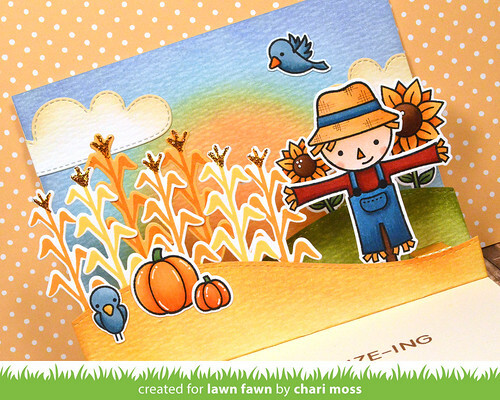 I stamped the cornstalks with sunflower ink on white and carrot ink on white & sunflower cardstock. I blended the hills with scattered straw and fossilized amber as well as shabby shutters and peeled paint. The sky has dried marigold, scattered straw, tumbled glass and shaded lilac. I added a little antique linen distress to the tops of the clouds as well. I really love how this one turned out! Be sure to check out the Lawn Fawn Blog for more Pop-Up projects! Oh Chari, these cards are absolutely AMAZING! I love how you kept the outside simple and made the scenes inside. What a wonderful surprise for the recipients! TFS! Two awesome cards! 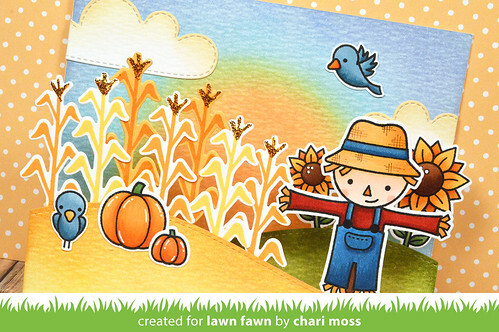 Love the Distress Ink background so pretty and the coloring you do is perfect! Thank you for a great inspiration week with lawn fawn! 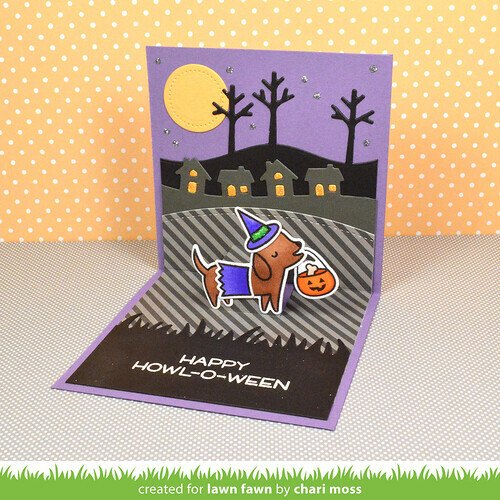 All your Lawn Fawn cards are just amazing! Love them! Shari--these are so great! I loved the little doggie surprise in the first one and the inside of the second one is truly A-MAIZE-ING. Your shading is spot on for a fall day in Iowa, which is where I imagine this scene is. TFS! !